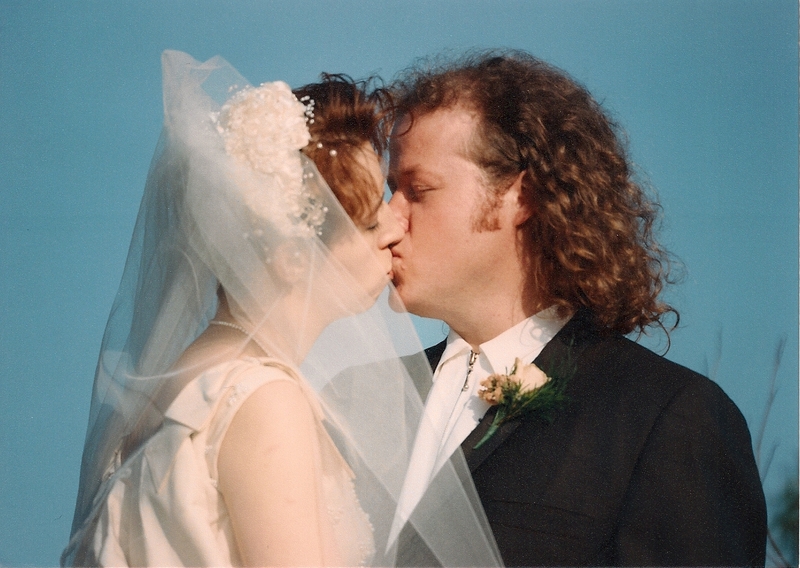 Happy 20th anniversary to that guy I met on my golden birthday. The one I hired for a shoot by mistake. I was 25 on the 25th of September in 1992 and I meant to hire Dave Cosby for that little half day shoot but I got caught in a bout of rolodex dsylexia. I had avoided booking that David Carlson because I thought he was arrogant. He groused about the shoot the first time I’d called. “I’m taking my band to Brazil” he stated, “you’d have to fly me to the location.” “Well, I don’t need a rock star,” I returned, “I need a shooter and this crew is driving to the location.” I told myself I would not try to book him again. The misread on the index card caught up to me just after I confirmed the booking. He showed up wearing a black cap, his curly hair pulled back into a ponytail. He smirked and flirted shamelessly, then he asked me out for a drink. I showed up to Rainbow Club around the corner from my house with my posse of female friends. We closed the place after many cheap beers and deep conversations, the girl gang had gone home and it was just us. I would not let him drive me home, you know, because I’m all independent and such. I walked home as he trailed along behind in his car at 3am in East Village back before it was filled with trendy bars and eateries, before Starbucks, before upscale apartments and fitness centers. It was an adventure. I married that guy 9 months later, in a television studio in downtown Chicago in a ceremony we designed with electronic music, 15 lighting changes, three sets, poetry, live music and a fog machine and spotlight to usher me down the aisle. It’s still an adventure, an amazing and beautiful adventure. Happy anniversary, David Carlson. I’m tremendously grateful for you, for us, for all of it. This entry was posted in things you never knew about mrs metaphor and tagged chicago, rainbow club, tv38, twenty year anniversary by mrsmetaphor. Bookmark the permalink. Congrats on your 20 years! I remember that like it was yesterday. What a fun time we all had. It was the first time I had been to Chicago. Margaret, Kathy and I planned to paint the town red later that night. We all ended up falling asleep and never did anything! When might you be making it back to the greater Cincy area? We really need to get together! one of my favorite topics is: “how they met” I really love this one. congrats and many happy years together.